Another cold day, another soup recipe. I used to make this soup a lot, but I haven’t attempted it since going vegan, because the original recipe had milk and cream, but soymilk works just fine. I love this soup, because it is thick and comforting with the contrast of pieces of vegetables and corn crunch against the soft potato and onion background. It is perfect for cold weather as it is so substantial. It also can be made out of things you are likely to have in the fridge or cupboard. Peas and corn are vegetables that freeze well and canned corn is also fine. Most vegies don’t really survive freezing or canning that well as it alters the texture. Corn and peas seem to be the exceptions. You could also make it with fresh corn and peas. The constants in it are corn kernels, onion and potatoes, with other veggies added according to what I have in the fridge. Mushrooms, peas and red peppers are probably my favourite so that’s what I have included in the recipe below. Cook potatoes in a large saucepan with the water and the reserved corn liquid. If using fresh or frozen corn add an extra half cup of water. Mash about half the potatoes roughly in the liquid, you want some chunks. Meanwhile dice the onions and fry in the oil until well cooked and golden. Add the diced mushrooms and capsicum and cook until softened and caramelised. Add the soy milk to the potatoes. 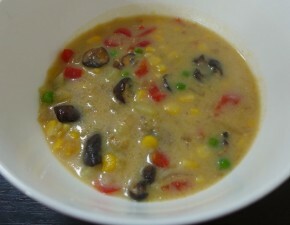 Add the cooked onions, mushrooms and capsicum, corn and peas to the saucepan and reheat gently.